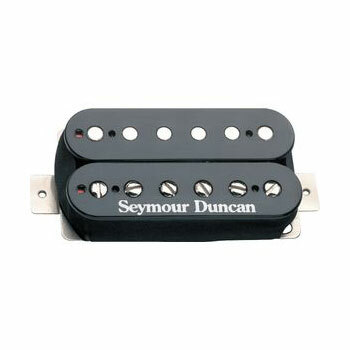 The Seymour Duncan TB-4 is the archetype hot-rodded Humbucker for over 30 years. Great for everything from heavy blues to heavy metal. This "Trembucker" version was designed to accommodate the 2-1/16" string spacing on a modern Strat® tremolo bridge. This is the Trembucker (F-spaced) version of the JB Model Humbucker. Designed in the early 70s, the JB Model Humbucker adds juice to the bridge position of any Humbucker equipped instrument. With its hot coils, and alnico 5 bar magnet, this pickup delivers an unmistakable upper midrange attack, a tight, articulate low end, and harmonically rich highs that can really sing. The JB is the perfect bridge pickup for anything from blues & country to the meanest hard rock & metal. Pair with the Jazz neck model for the ultimate Hot Rodded Humbucker set. Trembucker's have wider pole piece spacing, perfect for symmetrical positioning under the strings of guitars with a tremolo or wide spaced hard tail bridge (2 or wider from the center of the Low E to High E directly over the bridge pickup). Hand built in our Santa Barbara, CA factory, the JB Trembucker uses an alnico 5 bar magnet, nickel silver bottom plate, 4-conductor lead wire for multiple wiring options, and is vacuum wax potted for squeal-free performance. The JB is the world's most popular Humbucker. It provides slammin' output while retaining singing highs, aggressive harmonics, and just the right blend of sustain and distortion. Goes from sweet warm tones to raw rock 'n' roll. Compared to the SH-14 Custom 5, the JB has a stronger treble detail. Some players use it with 250K pots to smooth out the highs. Comes with four-conductor hookup cable. DC Resistance: 17.40k - Resonant Peak: 5.50KHz.